Sipping tea after a maybe-not-final visit to Picasso Sculptures at the Museum of Modern Art, a friend shared the dots she’s been connecting about her Reiki self-practice, and how long her list of Reiki goodies has grown. She told me how difficult staying with daily practice had been in the beginning, that it took time before she felt much during self-practice. At first, it was the subtle improvements she noticed between practice sessions that kept her motivated. Her business has long stretches between big wins. Staying optimistic through a dry spell helps her create opportunities instead of panicking. 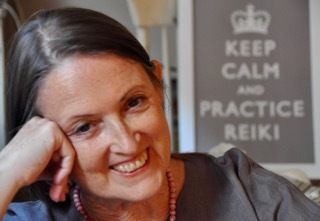 Her understanding of practice has evolved gradually in the five years since she learned First degree Reiki. So has her relationship with her mind, which she says is now steadier and sharper than ever (it always seemed sharp to me!). 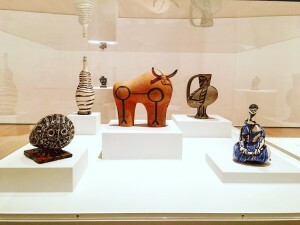 As her appreciation of practice deepened, she let go of an unnecessary intensity she had brought to practice, and finally, her self-practice became enjoyable. Her most recent goodie? The realization that her understanding, her state of mind, will keep evolving as long as she keeps practicing, that there is no end to the goodies practice brings. Her speech was measured and thoughtful, and her joy of discovery radiated gave her a beguiling, childlike freshness. I listened and realized, that’s what people really want to know — and see — when they ask friends about Reiki: how Reiki practice enriches their lives. Who doesn’t want the glow she has? What do you share when asked about Reiki? Some people don’t share how Reiki practice helps them because they’ve never thought about it. Think about it now. 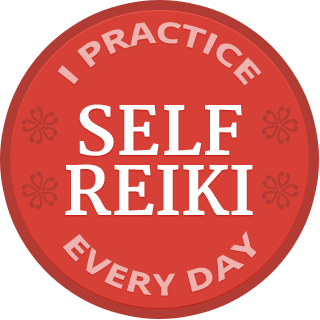 How does your Reiki self-practice help you? What is the first thing that comes to mind? Please share it in a comment below. And try sharing it next time a friend asks you about Reiki practice. First thought about Reiki is an intense magnification of vibrations flowing from my hands and spreading from my head to my toes. Sometimes it us so string it frightens me. When I place my energized hands over a friend or animal’s body, it feels completely natural and I relax knowing that all I have to do is TRUST. Yes I have compliance confidence that I am only a channel and the person receiving the treatment will direct the Reiki where it is most beneficial. Really i improved concentration and a cooling effect to body , relaxation from the belly pain after food. These are the first effect that i realised after my first reiki practice . I use Reiki every day, in every way. it keeps me balanced and aware and in the flow. It helps me when I want to control something,; it allows me to back off and trust. Yes, trust, that is the biggest thing it has given me. It allows me to let go of concerns and trust the process. Awareness – Presence – Stillness – Gratefulness. Through my daily practice, I have become more aware, aware of my thoughts, my words, and my actions. I have become more conscious of when I am reliving the past or when I am projecting myself into the future. As a consequence of my evolving awareness, I have become more present in my daily life, which at times takes me to a place of deep stillness. I feel blessed and extremely grateful that “I AM REIKI”. I have found that Reiki has moved me from being a religious person to opening up to wonderful spirituality ,accepting so much more than I was open to previously, yet maintaining what I grew up with. Self reiki has and is still helping me to grow in many ways. To be able to help others is such a natural process. Self reiki also is so clearing of my mind, calming and not feeling so mentally busy. The physical warmth and radiant energy that I feel at the spot where my hands are placed is what keeps me doing daily self Reiki, usually while watching TV. I am very busy as primary caretaker of elderly parents, which means I need to do multitasking. It works for me! Different There is nothing like it and Pamela Thank you for your messages! The practice of Reiki has put me in a beautiful place. The practice of Reiki has helped me to be more understanding. I appreciate how fullfilling my life is and how supportive my friends and family are. The first thought that came to mind about self practice is deep peace and a quieter mind. Wonderful, Susie! Now imagine how many people would like deep peace and a quieter mind! I practice Reiki daily on myself & family & pets. My children are surprised when they have a health problem and after treating them and it is gone they say mom you have a gift. It is a blessing to me and I feel when the timing is right it all works out for their highest good. I hope to work in a practice when I retire so I can bring in the light & healing love? ?